I blame Raymond Chandler. Until he created his vivid acerbic pen portraits of Los Angeles, classic mystery fiction had strenuously avoided anything as vulgar as a sense of place. 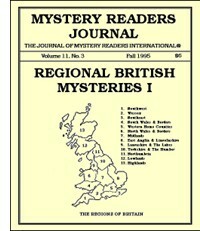 For years, the only real place in British mystery fiction was London. Apart from the capital city, murders took place in imaginary Home Counties villages, improbable country houses set in vast unpopulated estates and, occasionally, in exotic settings like Scottish castles or Oxford colleges that bore little resemblance to their real counterparts. After Chandler, American crime writers realised that rooting novels in real places had definite advantages, so they followed suit. As usual, it took a bit longer to catch on across the Atlantic. We Brits like to study things very carefully for a very long time before we do anything as rash as make changes. It took the best part of fifty years for us to really learn the lessons Chandler demonstrated back in the thirties. Now, the British regional crime novel is alive and well and living anywhere but London. My Kate Brannigan novels are set principally in Manchester and feature other towns and cities in the north of England. Like Seattle, the first thing outsiders say about Manchester is “That’s the place where it rains all the time, isn’t it?” As with Seattle, rainfall is only a rumour we spread to keep the outsiders at bay. I’m not a native Northerner. I come originally from Scotland and before I moved to Greater Manchester, my experience of England had been gleaned from three years at Oxford and two years working in Devon and Cornwall. My knowledge of the north of England had been gleaned from popular mythology and the world’s longest-running TV soap opera, “Coronation Street,” set in the fictional northern city of Weatherfield which everyone knows is really Salford. Salford stands in the same relationship to Manchester as Minneapolis to St. Paul, Buda to Pest. They’re separated only by a river, but nevertheless their inhabitants imagine a vast cultural gulf. As a result of this indoctrination, I expected everyone in the north of England to wear flat caps and wooden clogs, to keep whippets and racing pigeons as pets, to eat nothing but tripe, black pudding and mushy peas, to live in huddled, grimy streets of redbrick terraced houses, to occupy their leisure time betting on horse racing or drinking in the local pub and to keep sane only because of their gritty northern humour. The landscape, I knew, would be an endless procession of terraced streets, factories spewing smoke into the air and cemeteries filled with the victims of industrial disease. The reality came as something of a shock. I found myself living just outside the city in Buxton, a Georgian spa town with a gem of a Victorian opera house, surrounded by the spectacular limestone gorges and cliffs of the Peak District landscape. The people wore the same clothes as they did in Glasgow or Exeter, and they ate much the same food. Judging by the number of theatres and concert halls in Manchester and the surrounding towns, they were a lot more cultured than their London cousins, most of whose theatre seats are occupied by tourists. The only thing I was right about was the sense of humour. Northerners can always find something to laugh about, even in the face of death. I fell in love. Manchester became home faster than anywhere I’ve ever lived. It’s essentially a Victorian city, and most of the centre has survived the depredations of the sixties town planners who ripped the heart out of so many British cities. In Manchester city centre, if you lift your eyes above the level of the shop windows, on almost every street you see ornate stonework, fancy brickwork, elegantly shaped windows, grotesque gargoyles and Corinthian columns. It’s also a very compact city—you can walk around the centre easily and quickly. Nowhere is ever far from anywhere else you might want to be. It’s a city with a vibrant and exciting life. We have a large Asian community, reflected in the dozens of restaurants that cluster together near the universities and the big teaching hospitals. We have our own Chinatown, a Dragon City like San Francisco, with the best Chinese eateries in Britain. We’ve got a substantial West Indian population, one of the reasons why our music scene is the most innovative and influential in the UK. There’s surprisingly little racial tension; most serious disorders in the city come from wars over drug turf rather than issues of race. We’ve also got the Gay Village, a compact conglomeration of gay bars, clubs, restaurants and businesses, a liberal and laid-back area that is becoming an international tourist attraction in its own right. In the realm of sports, Manchester United is a name recognised whenever soccer is played. Sometimes, it’s the only words of English kids speak, apart, of course, from Coca Cola. It’s also a city that does crime. We get it all. We’re a big enough commercial centre to get white collar crime. We have serious gang wars, so serious the British press last year dubbed us “Gunchester”. We get strange murders. We get bizarre frauds. And of course, the north of England is where the serial killers come from — the Moors Murderers, the Yorkshire Ripper, the Black Panther, the Fox. After fifteen years living in this extraordinary city, I feel like an adopted Northerner. How could I not write about it? The truth is, I was wary. I was afraid I wouldn’t do it justice. I was convinced that if I got it wrong, people would hang around in dark alleys waiting for me to pass so they could beat me up. (Back then, I thought people knew who writers were and cared what they had to say…) The first three mystery novels I wrote avoided the city altogether. But as soon as I started thinking seriously about creating a woman private eye, the first thing I knew about her was that she would be based in Manchester. The city I write about is a real place, with imaginary additions. Readers can easily identify landmarks and districts they’re familiar with. They can follow Kate’s footsteps through the streets, drive the routes she drives. It’s a trick we writers play on our readers. Crime fiction requires the wholehearted suspension of disbelief. If I tell my readers the truth about the places they know, they’re more likely to believe I’m telling them the truth about the things I’ve made up. Of course, there are limitations on how much reality a writer of fiction can incorporate. Sometimes I have to invent places — premises where drugs are dealt, houses where pornographic films are made, streets where murderers live. But again, because I know my city, I can place these fictional additions in convincing locations. For example, in Crack Down, I needed to create a nightclub that was a centre for drug-taking and car theft. I placed the club in an area of Manchester city centre where there are a lot of nightclubs, but I put it under the railway arches in a street where there are businesses but no pubs or clubs. Other places are slightly disguised to protect the poor souls who have to live and work there. I know the houses that Kate and her lover Richard inhabit, though in reality there is no conservatory that runs along the back, linking the two bungalows. I can point to Kate’s office window, though it’s no private eye agency occupying the building in question on a busy corner of Oxford Road. Of course, Kate’s work takes her to other locations. In Dead Beat she crosses the Pennines to Yorkshire and visits a rock star’s country mansion in Cheshire; in Kick Back she spends time in rural Buxton and among the neo-brutalist housing estates of Warrington New Town; and in Clean Break she leaves the country in pursuit of stolen art, crossing Europe in a wild car chase that ends up in Italy. But when she visits these other places, she views them with the eyes of an outsider, making the same snap judgements and assumptions we all do when we come to a new place. I figured I’d be quicker picking up the motorway than going home by the more direct crosstown route. A few minutes later, I was doing eighty in the middle lane, The Pet Shop Boys blasting out of all four speakers. The huge arc of Barton Bridge glittered against the sky, sweeping the motorway over the dark ribbon of the Manchester Ship Canal. As the bridge approached, I moved over to the inside lane, positioning myself to change motorways at the exit on the far side. I was singing “Where the streets have no name” at full belt when I automatically registered a white Ford Transit coming up outside me in the middle lane. I paid no attention to the van as it drew level then slightly ahead. Then suddenly, his nose was turning in front of me. My train tripped into slow motion. Everything seemed to last forever. All I could see out of the side of my car was the white side of the van, closing in on me fast. I could see the bottom edge of some logo or sign, but not enough to identify any of the letters. I could hear screaming, then I realised it was my own voice. The front of my car seemed to be sandwiched between the struts of the crash barrier. I was tilted forward at a crazy angle. Below me, I could see the lights twinkling on the black water of the ship canal. The cassette player was silent. So was the engine. All I could hear was the creaking of the stressed metal of the crash barrier. I tried to open the driver’s door, but my right arm was clamped in place by the crushed door. I tried to wriggle around to open it with my left arm, but it was no use. I was trapped. I was hanging in space, a hundred feet above the empty depths of the canal. And the Ford Transit was long gone. I can’t drive across Barton Bridge in the slow lane any more. I get cold sweats. I have to pull over into the middle of the road where no one can sideswipe me. I get some funny looks from passengers when there’s no other traffic on the road. I don’t care. I know what Manchester can do to a girl. Believe me, it isn’t all fun. I wanted to write about Edinburgh, Scotland for all sorts of reasons. I was born about twenty miles north of the city in what’s called the Kingdom of Fife. More than a thousand years ago, Fife was actually called Fib, and in Scots a fib is a lie or untruth. So maybe I was destined to become a teller of stories. In my case, stories about Edinburgh. I lived in Edinburgh for the eight most important years of my life. I attended University there. Afterwards, I met my wife there and was unemployed there, eventually finding (and losing) interesting jobs: tax collector, singer in a punk band, alcohol researcher… I got to know the city in its many guises, I lived on some of the rougher housing schemes which encircle the city, and I saw a side of Edinburgh the tourist never sees, if he or she is lucky. They say you write about what you know. Well, I knew Edinburgh. What’s more, I couldn’t see anyone else writing about the place. In the early 1980s when I was starting to write, it seemed all the Scottish novelists were in Glasgow: Alasdair Gray, Jim Kelman, Willie McIlvanney. It didn’t seem right that Edinburgh should be so under-represented; after all, it was ripe for fictionalizing. Edinburgh is schizophrenic, and exhibits a definite dual personality. A look into the city’s history told me this was nothing new, and also hinted that in writing about Scotland’s twisted present, I might be saying something about its past psychoses too. Perhaps the most famous writer to emerge from Edinburgh remains Robert Louis Stevenson. His “Dr Jekyll and Mr Hyde” may be set in London, but there’s little doubt he was writing about Edinburgh. Jekyll is a Scots name (pronounced Jee-Kill) and the idea of the dual personality fits wonderfully well with the character of Stevenson’s hometown. I once heard Edinburgh’s character described as “public probity and private vice.” In this respect, the model of Edinburgh in human terms remains Deacon Brodie. Brodie was a respected citizen by day, a deacon of the city and a locksmith. By night, however, Brodie was a riotous and corrupt individual, who employed a gang to break into those houses he had himself fitted with locks. The Old Town section of Edinburgh used to be a nicely democratic place, where rich and poor would mingle, either on the street or else in the drinking dens and oyster bars. They even shared the same tenement space, with the rich living close to the ground floor, the poor living closest to the sky. Things changed towards the end of the eighteenth century. The New Town was built, and “polite society” decamped from the Old Town. This, historians have said, was Edinburgh’s turning point. Things could not be the same again. Well, in fiction, anything is possible, and my John Rebus novels show the Establishment and the 1990s underclass in close association. Indeed, the real distinction between them is that when the Establishment breaks the law, it does so with more impunity. That’s all. All of which may make my books sound dry and scholastic, but it’s impossible to be arid when you’re writing about the Scots. We’ve got too healthy a sense of humour, based mostly in irony. The Scots tend to joke with a straight face, and can be at their most serious when smiling. Rebus loves a bad pun, a killing joke. Policemen have a dark sense of humour at the best of times; Scottish policemen are darker than most. And of course, Rebus’ very name is a joke. When I wrote the first John Rebus novel, Knots & Crosses, it was not with the intention of creating a series character. So I could afford to give my hero a silly name. A rebus is a picture puzzle, and in Knots & Crosses, Rebus is solving tantalizing clues in the mail—knotted pieces of string and crosses made from matchsticks. If I tell you that in Britain we call Tic-Tac-Toe noughts and crosses, you’ll see already the air around Rebus was thick with wordplay. I left Edinburgh for London in 1986. The second and third Rebus novels were written in London, and the most recent novels have been written in France. Distance helps. I return to Edinburgh four or five times a year, to research, to listen to stories told to me in bars. I find my idea, my Big Theme, and I interview police officers and forensic pathologists, journalists and drunks… Then I scurry back to France to write the books in isolation and from a distance that makes descriptions creative rather than mere reportage. Scotland cannot boast a tradition of mystery writing, unless you include Stevenson and John Buchan. But we have had (and continue to have) some great gothic writers, and there’s something of the gothic in John Rebus’s Edinburgh. Scotland also has a strong tradition of adventure writers (think of Sir Walter Scott), and the Rebus novels aren’t so much pure or traditional whodunits as they are psychological—maybe even pathological—adventures. Ian Rankin is the author of the Inspector Rebus series. Matthew was about 13 and Annie about 11 when their mother died in childbirth in 1979, and their father went quietly insane. The two children were concerned that, if anyone discovered their father’s condition, they and their two younger brothers would be taken into care. Therefore, with a maturity beyond their years, they invented a life for themselves and their father, fooling the neighbors into believing that all was well, while, behind the scenes, the two eldest took care of the house, garden and the two youngest. It wasn’t until Carmen O’Keefe came calling that Matthew and Annie’s little charade started to come apart at the seams. And then, while discovering that all was not as it had seemed with their father and mother before her death, they discover, as well, Carmen’s stabbed body in the back garden. The two conspire to conceal the body and go on living as if nothing had happened, all the while trying to find out who really killed Carmen. It is not until 1993 that the solution is finally made clear, although Matthew had suspected for some time. Agatha still hasn’t settled in and been made welcome in her new Cotswold home. After all, she is still too pushy, too bossy, and her single neighbor is terrified of her and her bald-faced advances! But, like every other single lady in the village, Agatha sees a chance in the new veterinarian in town—who is handsome and something of a flirt. So Agatha wangles a date—and is stood up. This angers her, and she starts snooping, only to find that the vet is not at all kind to animals, let alone women. Eventually he is murdered, and Agatha is hot on the murderer’s trail! It helps that that nervous, terrified single neighbor is interested in helping investigate—perhaps she can make time with him after all? Charles Paris has a Job! Not because of his acting skills, but because he bears a faint resemblance to a missing man, and an ITV television program which specializes in reconstructions of unsolved crimes, with the support of the investigating police, are going to do a reconstruction of this man’s last known movements. Charles finds himself in Brighton, practicing the missing man’s walk, filming his route from a pub in The Lanes to the Palace Pier, being mistaking by a member of the public for the real missing man, and being drawn ever deeper into the search for what now seems to be a murderer. He’s never played a corpse before, and finds the people involved with the television program just a little too much to take—but then, all television people are strange. The time is 1978, and Superintendent John Coffin is not at all sure about the reputation of the house a few doors down from his own. It seems that people meet horrible deaths when they live there, according to his housekeeper. And when the daughter of the house is killed along with her mother and father, Coffin feels impelled to investigate the history of the house as well as the motives for murder. An interesting treatment of racial problems in London, as well as delightful characterization of Coffin, the housekeeper, the young girl who does his laundry, and the suspects.